This is a review about Portland Variety, but it is really about their new head chef Matt Cowan, who is turning the restaurant into one killer place to eat. I want to talk a bit about Matt and then about the meals I have eaten at Portland Variety. Matt was a latchkey kid; for those of you who do not know this phrase it means he came home alone or, in Matt’s case, with a sister in tow. Both parents worked and it was up to Matt to make snacks for the two of them. Matt started his love for cooking snacks, and his 11-year-old claim to fame was having the wherewithal to add Cheese Whiz into the Kraft Dinner, a lovely creamy embellishment. At 14, Matt worked as a dishwasher for a crazy angry chef who was the proud owner of copper pots that Matt had to clean. If there was a speck of dirt left, the chef heated the pot and threw it. Crazy, yes, but it is this passion and the passion of the other cooks that held Matt’s attention. It is funny, as when Matt told me this story, all I could remember was when I was at Cordon Bleu in London, England, I also worked in a restaurant on Greek Street in the Theatre District. I, too, had a crazy head chef. One day the lamb chops were sent back to the kitchen because the customer said they were under cooked. The chef took one look at the plate and the waiter and sent the entire dish clear across the kitchen. It was a case of duck and hide. When Matt was a wee bit younger, the Cooking Network had not yet been brought into mainstream and bastardized with pure and utter stupidity. After school, he was hooked on it and decided to take cooking class in Grade 11. Now, Matt was not from a cooking family and it was also not a case of survival as his mom cooked well enough. Matt went on to George Brown, but really feels as I do that cooking is taught in the kitchen and if you want to learn, really want to learn, this is where you need to be all the time. Matt has a passion for local and this came from chef-owner Beth of The Globe in Rosemont, Ontario. “This is not a fancy place, but a high-end country kind of spot where everything is made from scratch and as local as possible”, Matt said. Onward to the Millcroft under a master, Reinhardt Scher-Herrings, then Harbour Sixty Steakhouse, O and B group (Oliver and Bonacini) at the now defunct Steak Frites, Banff, PEC (Prince Edward County) and back to Toronto. Now, to the uninitiated, this seems like a lot of jumping, but this is how chefs learn their trade. We must continue to move, work under many to develop skills, learn techniques and also what we don’t want to do. Now - on to Portland Variety. There is a very neat group of gentlemen behind Portland Variety. The group is The Capture Group and one of the best parts of this is Milton Nunes, Le Gourmand who supplies Portland Variety with some of the most lovely pastries in Toronto. Portland Variety is a cool space with a little commissary or gourmet grab and go in the front, and cool restaurant in the back. During the week when the mornings are quiet, you can actually grab a great pastry and latte and sit in the light-filled very comfy back room. Weekends not so much as they are jammed packed for brunch. I actually had one of the best dishes I have eaten from brunch here. It was an Eggplant Biyaldi, which is roasted eggplant with roasted tomatoes, Moroccan spices and perfectly poached eggs. My only suggestion is that they take reservations like the rest of the brunch world; as me and many like me do not stand in line. Poached eggs on Eggplant Byaldi. I had a great lunch here with my good friend Marian of Branding and Buzzing fame. We were totally enamoured with a perfectly crisp and juicy half hen with the best Piri Piri sauce. This stuff needs to come in a bottle and I know just the girl to help you with that nudge, nudge. We also ate a roasted root vegetable salad with the surprise hit of fresh micro mint and creamy Burrata cheese. Whipped house made ricotta with spice roasted nectarines,pistachios and grilled sour dough. Roasted Hen with Piri Piri and a bed of tossed arugula salad. Beef Carpaccio with Celery leaf verde and Parmigiano shavings. Dinner was with four and that was great as it gave me a chance to try a lot of dishes. Our server was Zoe. Ask for her. She is incredible. She made some great recommendations one of which ended up being my favourite dish of the night - whipped house-made ricotta with spice roasted nectarines, pistachios and grilled Fred’s Bread sourdough. Matt keeps a focus on fresh and changes the fruit according to what comes in. My daughter and her friend were in love with the carpaccio, beautifully presented with celery leaf verde, a nice change, and shavings of parm. Portland Variety makes incredible cocktails and we tasted the Tequila Bong, which is presented smoking. I am, as a whole, not a lover of truly smoky things and I loved this drink. 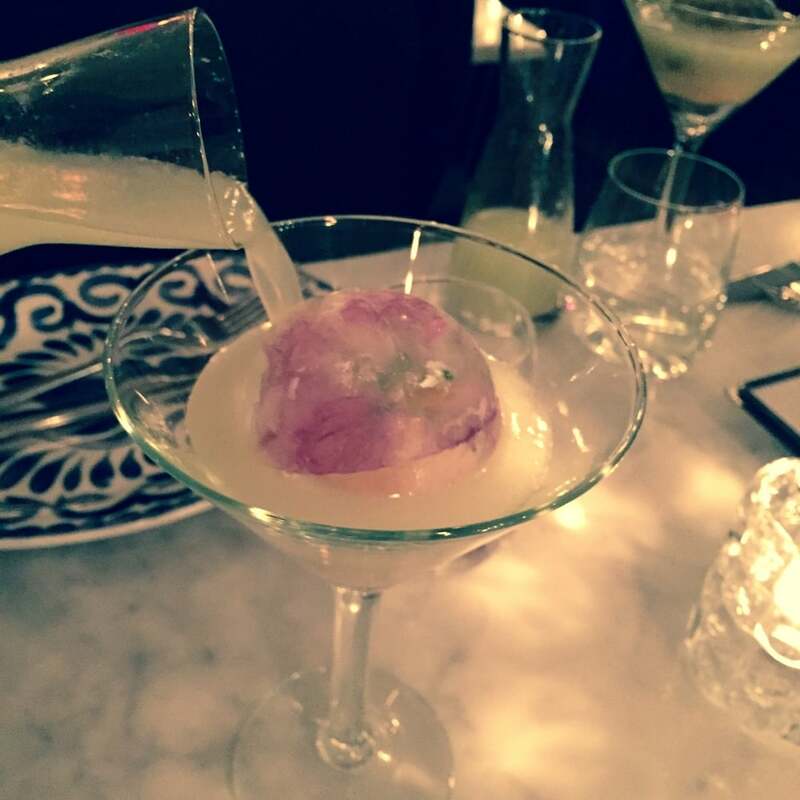 We also tried the Winter Garden, a very fresh Stoli cocktail, and the flowered ice sphere was so pretty. Eat the Cassava fries, tossed with spice, sugar and salt with the wicked piri piri mixed into an aioli and the Cauliflower “popcorn” with raita. Both fried, both not greasy and both served piping hot. Tequila Bong Milagro Blanco Tequila, lemon, pineapple, jalapeño infused agave and hickory smoke. Winter Garden Stoli Vodka, lime,basil and fresh cucumber. Cassava fries with Piri Piri aioli. Grilled Octopus with Chorizo jam. Next was the grilled octopus. This is a dish that when made well is great, and rubbery if not. Portland Variety’s was just great. My only thought was that the Chorizo Jam should be served warm as it is gloopy and, truthfully, I found it a bit overwhelming as the octopus was charred, which is a bit like a smoky taste, and the Chorizo was also very smoky. This quality of octopus needs a little more love. Braised Beef Shortribs with truffles semolina polenta and glazed roots. Perfectly braised beef short ribs with just the right amount of truffle in the semolina polenta were gorgeous with glazed root veg. This is a super rich dish and great to share as are all of Matt’s dishes. At night, Portland Variety serves a different, but equally wonderful version of the hen I love at lunch. This bird is deep fried and coated in hot honey. Oh yes, it is that good. Piri Piri fried hen with hot honey glaze. Ricotta gnocchi were pan fried and served on top of a Kabocha squash, brown butter puree with pine nuts and sage. I found the garlic a bit much as the squash is so delicate and the gnocchi perfectly executed. Personally I would have added a squeeze of fresh lemon or a bit of candied lemon instead. Ricotta Gnocchi with Kabocha squash brown butter Puree, pine nuts and sage. Zoe was, as I said, super nice and offered us a fun dessert board with Portland Variety’s famous (and I see why) chocolate chip and walnut cookies and the best Beignet in the city. I will totally stand behind this with warm salted caramel sauce, a very good brownie and last, but not least, something from the daytime that Zoe just said we had to try, called a Bichon au citron, which is like a glazed lemony square croissant that I am coming back for. Breakfast, brunch, lunch or dinner, this is a fabulous place with a great bar and incredible food. I will be back time and again. Try Portland Variety, say hi to Chef Matt Cowan and tell him I sent you.